Review: "A manner or style, a frame of mind, thought or existence" (Mode). "Intelligence quotient, the use of perception or awareness." (IQ). 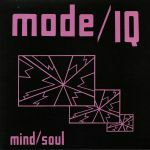 Mode I/Q, the self-proclaimed unknown band, was a richly textured, bold project starting life in 1979 out the embers of punk and new wave resulting in a hypnotic convergence of love, the future, life and art. Lucian and Nicolas, two creative spirits who viewed the world through their own prism, augmented by a moving cast of friends and acolytes, were together compelled to make great music. This was a concept from the heart, with transformativelive performances, channelling spaces into art "Mode" events orchestrated to bring about a full integration of site and sound. Psychedelic, punk overtones. A funky electronic hybrid, mixing Kraftwerk with black music. Guitars delayed and twisted through echo boxes and micro synths. Casio and Commodores delivering the machine funk. CBGBs, Max's Kansas City and Danceteria - Mode I/Q played and much, much more. Just 3 releases deep, 1984's mini LP Mind/Soul captures the band at their best. 6 songs to immerse, dance and shake the mind.